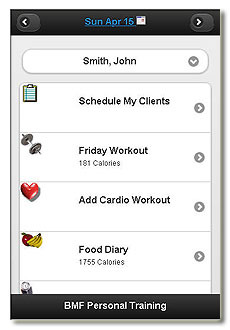 The eFitnessTracker Mobile Web App extends your site to a flexible, on-the-go solution. Just connect with any smartphone or mobile device to your normal web url, and you will be prompted with a mobile web app login option. 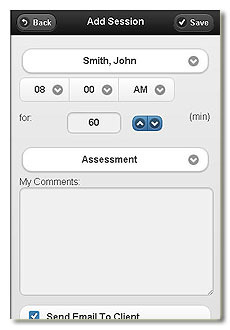 Trainers can see all their upcoming sessions to log their trainee's progress as well as all details on their client's calendar with scheduled workouts, food diary, measurements and notes. Also easily schedule new sessions, consultations, assessments, etc. right from your phone and even send emails directly to clients on updates. From the mobile app, trainers and clients can add workouts and see workout details. Quickly update workout details, add exercises with Recently Used Exercises and My Favorites views, see exercise details with media, and more! 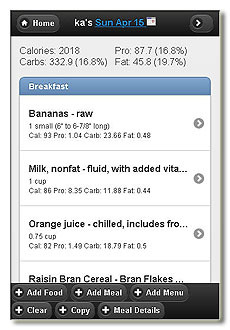 On the nutrition side, your complete Food Diary can be updated using your personal meals and menus, or by quickly searching the food library. There is also a listing of Recently Used foods and a My Favorites view. Each food shows a complete food label with nutritional details.